Not too big, not too small, but just right. That’s the way many people feel about compact cars—which aren’t nearly as “compact” as they used to be. Many are roomy enough to be family sedans while still getting good fuel economy, which is a large part of their appeal. Compact cars make up a prominent segment of the automotive market, and the class numbers about 20 for 2019. Front-wheel-drive four-door sedans with 4-cylinder engines dominate the class, though there are also hatchbacks, a couple wagons, one coupe, three hybrids (two offering plug-in versions), and one electric car with a range-extending gasoline engine. 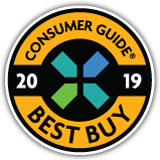 (Pure electric vehicles have their own Best Buy category.) Three compact cars offer all-wheel drive, but none are available with a V6 engine. The Toyota Prius gets a notable refresh that includes revised exterior styling, the Toyota Safety Sense P suite of safety technologies as standard equipment, and availability of the model’s first-ever all-wheel-drive system. The Chevrolet Volt gets several updates, highlighted by an available 7.2 kW charging system that Chevrolet says cuts charging times in half. Other Volt revisions include an updated infotainment system, a digital rearview camera instead of analog, and a 6-way power driver’s seat. The Chevrolet Cruze gets a styling facelift that includes LED taillights and a new front fascia, as well as a new infotainment system. The Hyundai Elantra sedan gets an exterior-design freshening, a revised interior, and an expanded roster of Hyundai SmartSense safety features, and the Hyundai Ioniq adds a driver attention alert system and automatic high-beam headlights. The Volkswagen Golf gets a turbo 1.4-liter engine in place of the previous 1.8, and 6-speed-manual and 8-speed-automatic transmissions in place of the previous 5-speed-manual and 6-speed-auto units. The rest of the class is either unchanged or sees minor revisions such as a rearranging of standard and optional equipment. The compact-car segment is a relatively homogeneous class, though there are a couple of vehicles that stand out. The Fiat 500L’s tall-wagon body style pushes it a bit toward the subcompact or compact crossover SUV category. Likewise, the Volkswagen Golf Alltrack ventures toward crossover-SUV territory with its raised ride height, hill-descent control, and other off-road-focused features. Those who live in very snowy climates might lean toward vehicles offering all-wheel drive. In the compact class, that narrows it down to the Subaru Impreza and VW Golf Alltrack and SportWagen. Fuel economy may top some people’s list of requirements, and though most cars in this class are quite efficient, a few stand out. The Chevrolet Volt extended-range electric car is noteworthy in terms of efficiency and “green” credentials. Traditional hybrids also do particularly well in city driving, and three are offered in this class: the Honda Insight, Hyundai Ioniq, and Toyota Prius (the Ioniq and Prius also offer plug-in-hybrid versions). The refreshed Toyota Prius is the only hybrid in the class to offer all-wheel drive. As of now, the Chevrolet Cruze is the only compact car to offer a diesel engine.